Many people already have their own favorite recipe for this dish, which shouldn't be difficult to adapt for GAPS. 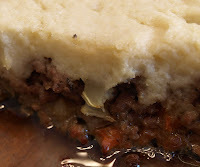 I had a pound of ground lamb that needed to be used, and some leftover mashed cauliflower, so this dish was very quick and easy to make. I chopped half an onion and sauteed it in butter, then added some chopped carrot and celery. I added the meat and seasoned it with crushed garlic, salt, pepper, and thyme. When the meat was cooked through I spread it on the bottom of an 8x8 baking dish and covered it with a layer of the mashed cauliflower. I dotted the top with butter and baked for about 45 minutes at around 350 degrees. It was simple but good. There are so many ways to make this dish that it is fun to experiment with. Later in the diet I may try it with lentils and chestnuts instead of meat for variety.